If that were what religion were, then even an atheist like me could be religious. 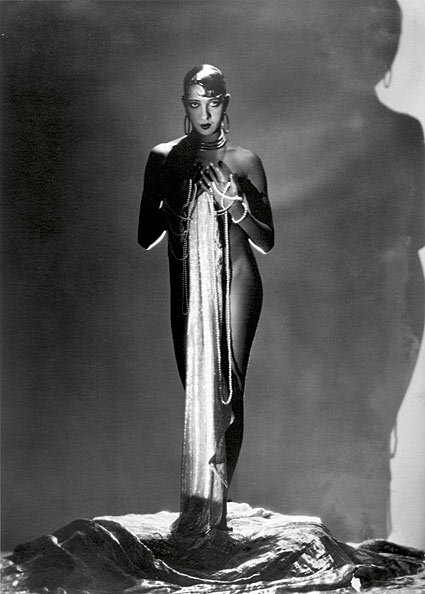 I've been a big fan of Josephine Baker for years. She died in 1975, the year I was born, but I'm probably in love with her. For a 37 year old white Canadian guy in 2012, this probably makes me a bit of an oddity. Every time I'm in New York City I try to visit her son's fantastic restaurant Chez Josephine to immerse myself in everything Josephine. Baker was the first African American female to star in a major motion picture, to integrate an American concert hall, and to become a world-famous entertainer. 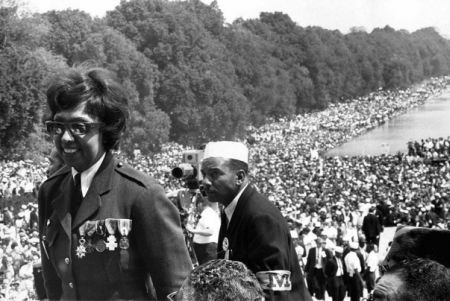 She is also noted for her contributions to the Civil Rights Movement in the United States (she was offered the unofficial leadership of the movement by Coretta Scott King in 1968 following Martin Luther King, Jr.'s assassination, but turned it down), for assisting the French Resistance during World War II, and for being the first American-born woman to receive the French military honor, the Croix de guerre. Baker dropped out of school at the age of 12 and lived as a street child in the slums of St. Louis, sleeping in cardboard shelters and scavenging for food in garbage cans. After a short while she was the most successful American entertainer working in France. Ernest Hemingway called her "… the most sensational woman anyone ever saw." In addition to all this, she used her fame and fortune to adopt twelve children from all around the world. She only delivered a child once, but it was still-born and it resulted in an emergency hysterectomy. A terrible loss. In the 1930s it seems as if she gave up on the United States. She became a French citizen, renouncing her US citizenship. In a way, who could blame her since the US never seemed to give her, a black performer, a chance. In 1951, a big star in France and past heroic supporter of the French resistance during the German occupation of France, she returned to America. 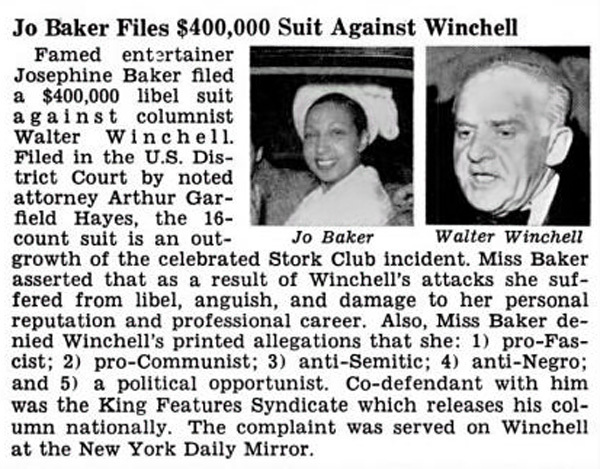 Winchell also labeled African-American-French entertainer Josephine Baker as a communist after she took him to task for not questioning the racial-discriminatory policies of the Stork Club in New York. His relentless campaign against Baker prevented her from getting her visa to enter the US renewed. Winchell's venomous views on Josephine can be found in this quote from Remembering Josephine. And when I got to New York way back then, I had other blows—when they would not let me check into the good hotels because I was colored, or eat in certain restaurants. And then I went to Atlanta, and it was a horror to me. And I said to myself, My God, I am Josephine, and if they do this to me, what do they do to the other people in America? You know, friends, that I do not lie to you when I tell you I have walked into the palaces of kings and queens and into the houses of presidents. And much more. But I could not walk into a hotel in America and get a cup of coffee, and that made me mad. And when I get mad, you know that I open my big mouth. And then look out, ‘cause when Josephine opens her mouth, they hear it all over the world. Here's a sound clip of a news report discussing Josephine's citizen's arrest against a racist in Los Angeles! Baker was bisexual. Her son Jean-Claude Baker and co-author Chris Chase state in Josephine: The Hungry Heart that she was involved in numerous lesbian affairs, both while she was single and married (she was married 4 times), and mention six of her female lovers by name. Clara Smith, Evelyn Sheppard, Bessie Allison, Ada "Bricktop" Smith, and Mildred Smallwood were all African-American women whom she met while touring on the black performing circuit early in her career. She was also reportedly involved intimately with French writer Colette. Not mentioned, but confirmed since, was her affair with Mexican artist Frida Kahlo. Jean-Claude Baker, who interviewed over 2,000 people while writing his book, wrote that affairs with women were not uncommon for his mother throughout her lifetime. She was a young, black, female, bisexual publicly accused of Communism in the McCarthy era - everything was stacked against her - but she rose to be something amazing. Could such a woman exist in this day and age and become something as spectacular? A day and age when there is mass protest when Miley Cyrus retweets a quote from Laurence Krauss and all hell breaks loose. Baker was found lying peacefully in her bed surrounded by newspapers with glowing reviews of her performance. She was in a coma after suffering a cerebral hemorrhage. She was taken to Pitié-Salpêtrière Hospital, where she died, aged 68, on April 12, 1975. Her funeral was held at L'Église de la Madeleine. The first American woman to receive full French military honors at her funeral, Baker locked up the streets of Paris one last time. I'll admit that I've always suspected, or perhaps wished that she would be an atheist, agnostic, light religionist or freethinker. Her personality suggested to me that this would be quite probable. And how could she accept organized religion that thinks so poorly of her bisexual sexual orientation? Wasn't her flourishing life much bigger than the confines of organized religion; transcending the cookie cutter norms that bound mere mortals. The creole goddess. I wanted to claim her as one of my own, so to speak. I was able to find very little about her religion ... on the Internet at least. 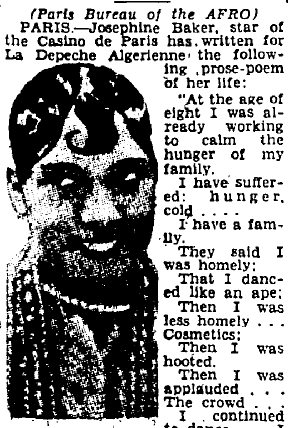 I haven't had a chance to read the biography by her son Josephine Baker - The Hungry Heart so I just don't know if I missed something. I likely got it wrong somehow. At the age of eight I was already working to calm the hunger of my family. I have suffered: hunger, cold. I save my money - for the time when I am no longer an attraction. But this is a religion. Maybe her religion. She invokes God frequently in a homecoming speech in St Louis (February 3, 1952). She had just returned to America. But I wonder about the libel suit she filed against Walter Winchell a mere month or so before, stating that she certainly was not a Communist. Was this just strategy? I have yet to read her son's biography about her. I don't want to unjustly put words into her mouth or thoughts into her mind. In fact, nobody ever could do such a thing. Josephine was always her own woman and even if she had a religion it was her religion. Even if she had a god then it was her god and nobody else could tell her otherwise. I believe she was a freethinker in the broadest sense and she's a hero of mine. She wasn't afraid to be herself and nobody else. She never had to come out because she always was - Josephine. Uncompromising. As I look forward to watching tomorrow's Reason Rally from a distance, I think about her stand in 1951 at the Stork club and her speech at the March on Washington in 1963. I'm somehow certain she would sympathize with the Stonewall protesters and support the Pride Parade. I wonder if she would be on our side if she were still with us now. Would she come to tomorrow's rally? Would she help us to be ourselves - to express who we really are even if that's not necessarily who she is? We will never know for sure, but I think she would. I hope that all of us, whether or not we can make it to the rally will bring something out of tomorrow's historic event. Some courage to be who we really are; to be able to come out to the world a little more -- to be a little more like Josephine.